The whole point of this is to detail something of a typical day for me. I’ve included some photos, but that isn’t going to make up for the unfortunate fact that, without meaning to, I actually chose quite a boring day to document. Sorry. There’s a lot of cleaning stuff up at home, resting, and fretting about one of “our” cats while discussing the other without a whole lot of resolution available to wrap up the issue. On the plus side, I guess I can open up this page post-baby when I have no time whatsoever and realise that actually, I wasn’t doing a whole lot when I did have oodles of time? Something autumnal to kick us off! 1:10am – Wake up, bathroom, return to futon. 3:30am – Wake up, bathroom, return to futon. Brain registers dull, PMS pain happening. Wearily remind self not to get excited as this happened last night too. My traipsing back from the bathroom woke R and he is a bit concerned. cat food. It’s cold enough at night now that we should have the window closed, but we don’t have the heart for it with the cats, especially since the baby’s arrival is going to put an end to that soon anyhow. Mark Two: This was actually taken during her later lunch visit, but she makes frequent appearances today so you might as well get the main idea now. 6:00am – Mark Two is done with breakfast and departs. There is no sign of Neko Neko, the other cat who has taken up lodging here and is arguably actually the star of the cat show. R and I are both worried since he was absent yesterday too. We are hoping he’s just wandering rather than in trouble or holed up sick somewhere. 6:30am – The alarm goes off for the first time on my phone, I hit snooze. This pattern usually continues every nine minutes until around 7:10am, but R is sleepy and cold today and doesn’t venture out until nearly 7:20am. 7:20am – R rolls out of his futon, gets dressed, goes off for a smoke and fetches his things. He asks, half-worried and half-hopeful, if I’m still in pain. I say no and tell him, again wearily, that I’ll call him if anything exciting happens. 7:30am – R departs for work on his motorbike. I spend the next hour drifting between dozing, figuring out what I’ll do with my day, worrying about Neko Neko and pondering when the baby will arrive. 8:30am – Finally drag self out of bed and take blood pressure. 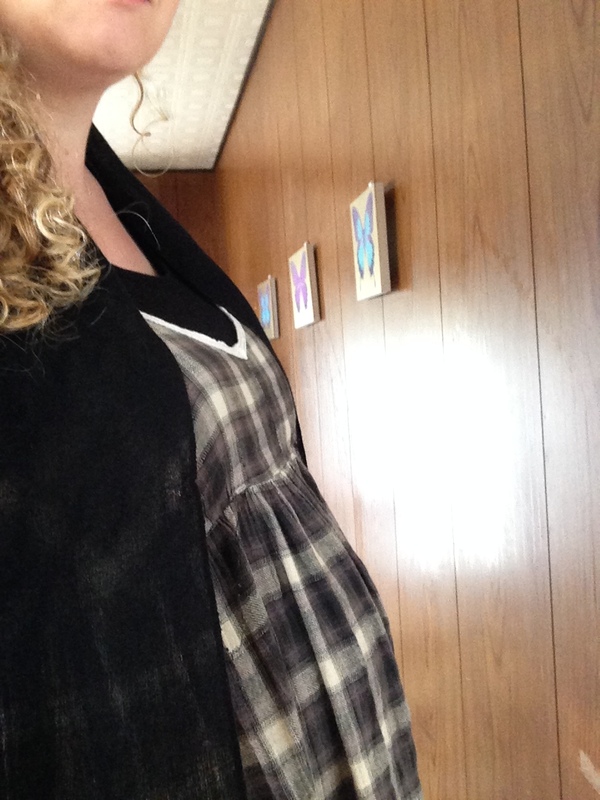 Being anxious at my prenatal appointments makes it spike, and Dr. I. decided that, to rule out high blood pressure medicine early on and make sure I wasn’t developing pre-eclampsia, that I should start taking it at home. That was back in May. Beyond showing what I understand is an expected average increase throughout the third trimester, my blood pressure has done very little of interest since, but I guess taking it at least feels productive. 8:45am – Stumble to the shower and then get dressed in the outfit below. Most of my maternity outfits are similar to this, a deliberate choice – I wanted dresses where it was a simple matter of modifying the layers because I knew I’d have to get through the horrors of the Japanese summer and then adapt for the autumn. 9:00am – Am hungry after a light dinner last night and craving something sweet already, so I make pancakes for myself. Notice I am cramping again, feel grumpy, and try to ignore it. 9:15am – Eat. My thoughts feel scattered this morning but the food soon makes me focus again. there is no way in hell that is a good idea for this year. Noting that I am checking e-mails here guilts me into actually replying to a few. Eat a banana. 10:20am – Decide that’s probably enough internet-ing and head off to change the sheets. This was on today’s agenda anyhow, but R randomly declared late last night that he believed his bedding had absorbed the stench of his feet. Since I feared this was true, this lent the whole thing some urgency. Stripping the futons takes longer than expected when am thwarted by a caught zipper. Eventually get load of washing started. 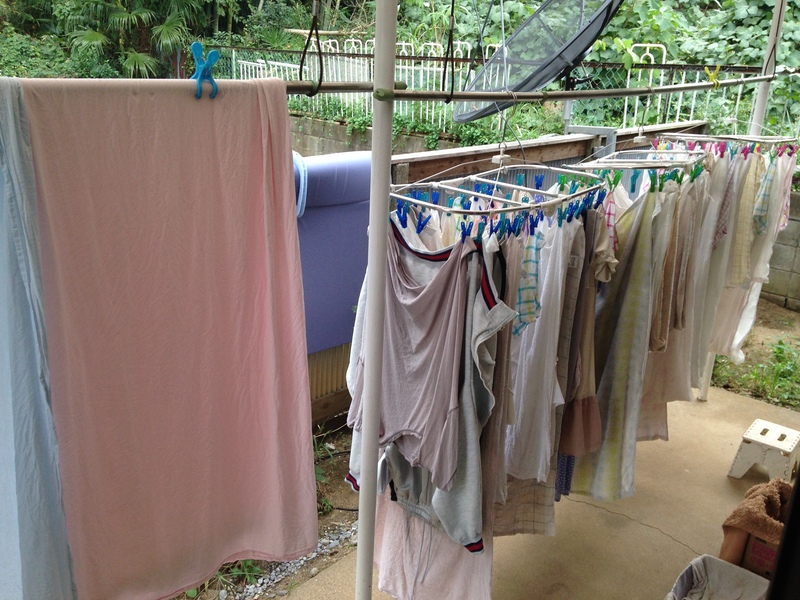 10:50am – A host of chores ensues – washing dishes, putting away dishes, folding and putting away laundry, hanging out the new laundry and starting a new load, tidying up, and hanging out the futons to air and beating them. Make some time in the middle to pose for outfit photo. Find myself thinking morbid thoughts until I start feeling sleepy again instead. 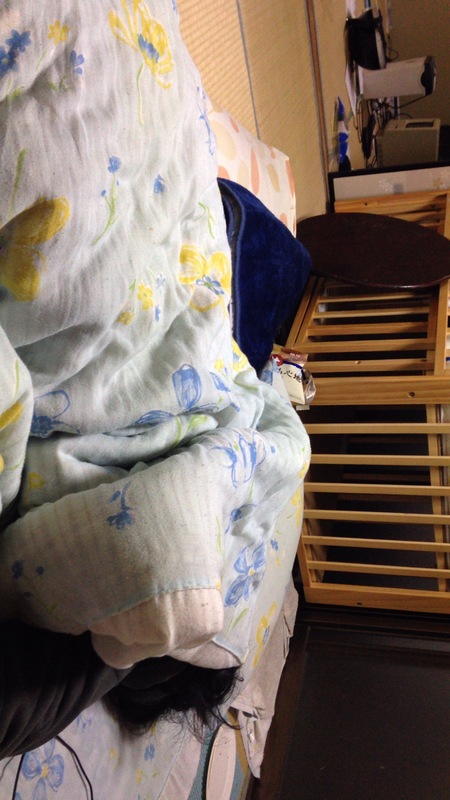 12:10pm – Discover that R’s futon itself smells like his feet. Those things are powerful. Febreeze it and leave it to dry. Eye the baby’s cot and realise there’s a discrepancy between the width of the cot and the width of the futon/mattress R bought for it – the latter is noticeably narrower. Get up and fiddle with it, not sure if it’s a problem that can fixed by including a crib guard or if we need to get another damn mattress. Urgh. Decide it’s time for a break. The main output of my morning. 12:15pm – Small amount of interneting followed by something approximating a nap. Baby is kicking around. 12:45pm – Am disturbed by the washing machine alerting me to it being finished with its latest load. Hang out the last of it. Feel mildly accomplished. Changing the sheets etc. is such a pain in the arse and so very time-consuming. No sign of either of the cats. Note the morning’s antics down, discover blog comments (yay) and approve them. 1:15pm – Not feeling that hungry yet so carry on with tidying stuff up. Turn on the Listening function on my Japanese app to practice/study/distract self from self while doing so. 1:25pm – Get interrupted by Mark Two, who has decided it is lunch time, and feed her. Call out to see if Neko Neko appears, but no. 1:35pm – Mark Two finishes eating and departs. Resume tidying. 2:05pm – Decide I am so very done for now. My lunch is a salad with leftovers from last night, corn soup and toast. I’ll be hungry later, but it’s enough for now. Prepare, eat, play with phone. 2:35pm – Wash up, bring the futons in, decide am heading out for a long walk but am not yet sure where. Make shopping list. Rest a bit to ensure back doesn’t give me too many problems and end up dozing off again. 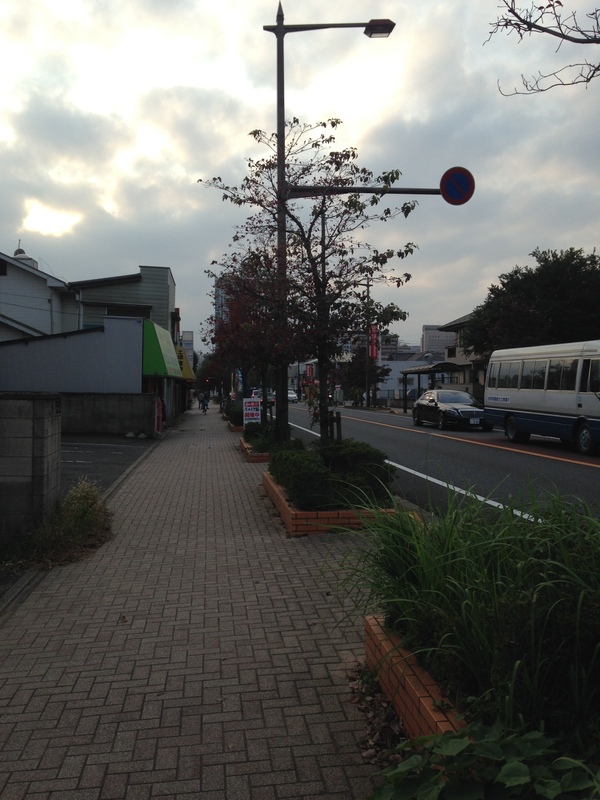 3:35pm – Finally head out and find myself walking towards the train stations and thus hub of town. 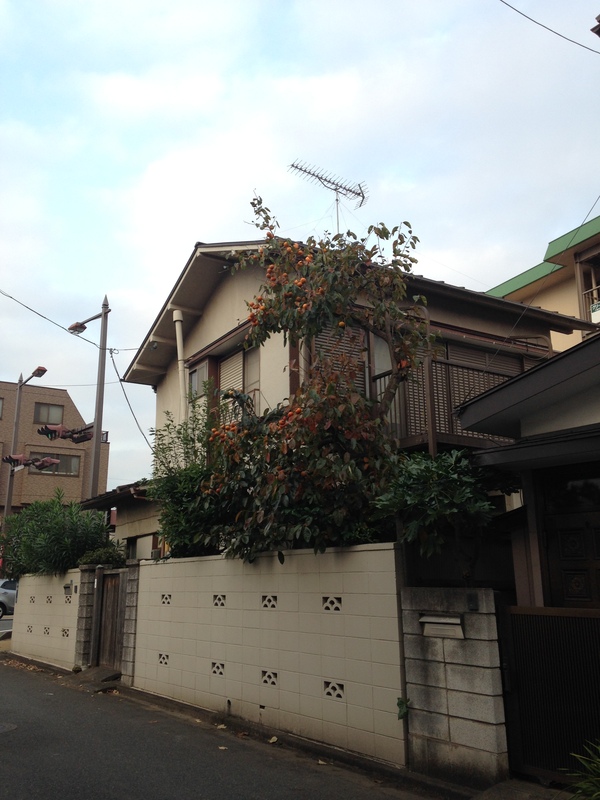 A random house from the walk with a persimmon tree outside. It ends up being a longer walk than anticipated and my stomach muscles are complaining by the time I finally find myself near some cafes. I need a break now – late pregnancy generally has been exacerbated by the seven weeks I had to spend resting and not much else, and the 2 miles I’ve walked today feels major. There’s nowhere else to sit down so a cafe it is. 4:20pm – Choose a cafe, head in and hang out for awhile. 4:50pm – Time to head home, decide to take the bus. Get the first one heading in the general direction of our house that comes along, get a normal seat and thus do not have to deal with not getting a priority seat, and ride it around to the supermarket to save making an extra trip out later. 5:10pm – Head into the supermarket and shop. Since I have to walk now and carry it all home, I stick to things I’ll need strictly tonight and tomorrow morning. Buy food and get informed that my pregnant stomach really stands out by the lady at the register. R grew up in this area and I’ve lived here for six years, plus I stand out at the best of times, so all of the supermarket ladies know us. Many of them who are otherwise lovely feel comfortable patting the belly too, which is NOT cool. 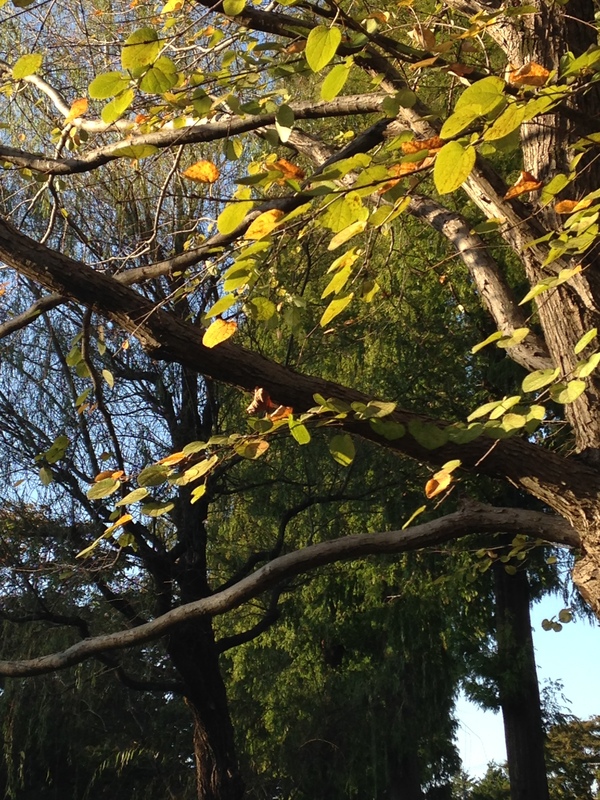 5:35pm – Head out, walk home. 5:50pm – Finally arrive home again. Put away the groceries, play with my phone and hear plaintive meowing at the door. 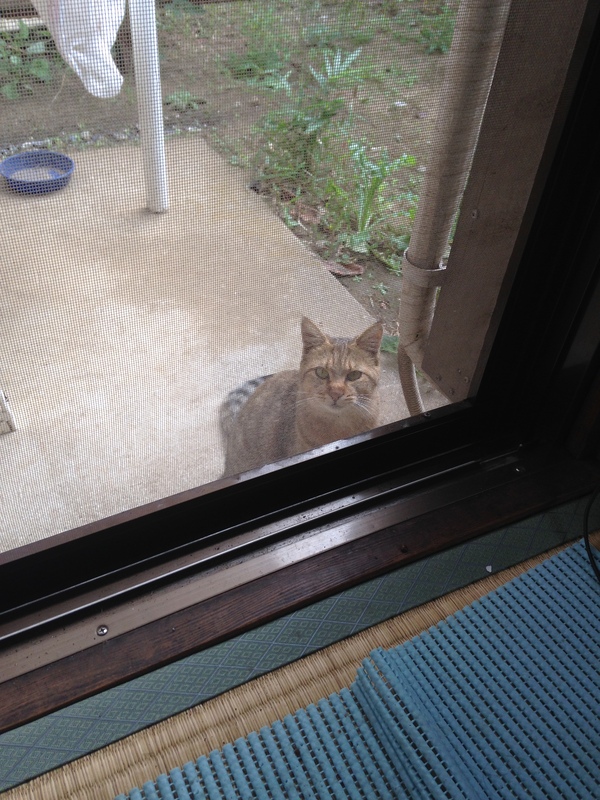 Mark Two wants her dinner now, still no sign of Neko Neko. Feed her. 6:00pm – R calls and I miss it. I try calling back a minute later and no response. Rest a bit, try again a couple of times, no luck. 7:00pm – Give up and go watch TV – I’m not hungry yet and I’m not going to bother cooking until I know roughly when R will return home. He finally calls again a couple of minutes later and reveals that he’ll be back “before 8” – this means “a bit after 8” – and that he got hungry and had a bento. We decide he’ll pick me up a bento too and I’ll cook tonight’s dinner tomorrow instead. 8:20pm – R cruises up on his motorbike bearing a bento for me and a side salad. Mark Two hears him arrive and, in what is characteristic for Neko Neko but less so for her, shows up at the door for more food and lots of meowing. I have a theory that she is actually looking for Neko Neko as much as she is looking for food and R is inclined to agree with me. She adores Neko Neko. Have mixed feelings about the fact she does not appear to know where he is either. 8:40pm – R and I lay out the futons and chat briefly. He plays an old version of Final Fantasy, and I play an online game. 9:45pm – Get a bit fed up with the game – I mostly only play in the evenings in spite of my currently open schedule because it’s usually quiet and I get left alone (there’s a lot of water under the bridge with me and this game). There’s also usually a lot of stuff available, yet there isn’t tonight for some reason. Work on an entry for the blog instead – it’s a shorter one so it doesn’t take long, and schedule it to be published for tomorrow morning. I do the majority of my writing in the evening, but I prefer to actually post during the day when I can get notifications about the posts without having them interrupt my already fractured sleep. Fiddle with the draft of this one. Mark Two visits again. 10:50pm – R is sleepy and I’m always up for more sleep myself lately. I leave him dozing on his futon and go get ready for bed. 11:30pm – Mess around with the phone for a bit because R has snapped out of his daze and is now watching something on YouTube. I’m actually internet-ed out, though, and am soon dozing off. R realises and turns off the lights. SLEEP!